November 08, 2018 at 3:51 pm. BOSTON — Undefeated and No. 2 Clemson can check off another box when the Tigers visit No. 17 Boston College on Saturday night. 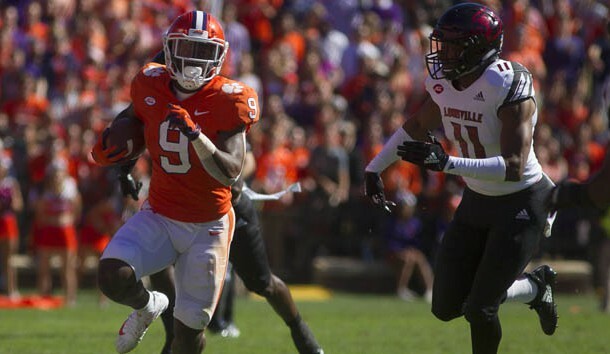 “We’ve got a great challenge and great opportunity this week in Boston College,” Clemson co-offensive coordinator Jeff Scott told Tigernet.com on Monday as the Tigers (9-0) began to prepare for the Eagles (7-2). “Obviously, it’s an opportunity for us to accomplish our second goal, which is to win the (Atlantic) division. Clemson, winners of seven straight over BC in the series, comes into this game as a 20-point favorite — and faces a bit of the unknown in the Eagles. BC star AJ Dillon, the ACC’s Preseason Player of the Year, took to Twitter last Saturday after his team rallied in the second half to win at Virginia Tech. But here’s the thing — there’s no guarantee Dillon will be there for this important prime time nationally televised game. Dillon, who missed 2 1/2 games with an ankle injury, returned with 149 yards and a touchdown in a win over Miami two weeks ago. He clearly wasn’t 100 percent and had 96 yards against Virginia Tech when he left after a hard hit on the sideline. He did not return as his replacement, Travis Levy, scored the first two rushing touchdowns of his college career in the victory. “I saw him yesterday and he was bouncing around, a good smile on his face,” BC coach Steve Addazio said Monday. “I mean he’s dinged up. It is what it is. That’s not going to significantly change one way or the other. The question just becomes how well he can handle that. But I would assume with these kind of injuries you’re not going to feel exactly the way you should feel until you get to a bowl game and have a few weeks. 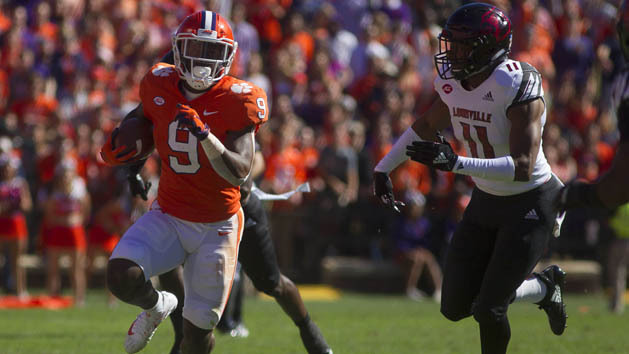 “I think they’ve got a number of quality backs,” Tigers defensive coordinator Brent Venables said. “(Dillon has) missed a few games and yet they are still playing for a division championship on the line this week. That speaks to the depth that they have and their ability to use guys in different ways. “(Levy), they’ve used him through the early part of the year in a variety of ways whether it’s the shotgun, zone-read stuff or a lot of screens and getting him out in space. He gets in there this past week, and he had done it prior to that in their heavy stuff and he would run hard, tough, and physical between the tackles, too. More explosive.